Are you planning your wedding overseas or interstate or even here in Sydney or Melbourne?? You have come to the right place. We are sure you will enjoy visiting this site as there are so many types and styles of bouquets that we can make for you. Keep in mind that even in our Fresh Flower section, substitutes can be made in artificial flowers. Fresh flowers can only be supplied in the greater Sydney Metropolitan area, Australia. Our crystal and artificial bouquets can be sent anywhere in the world, and they have been. Our association with the Australian Bridal Service now spans over 20 years and we have participated in more than 100 bridal exhibitions. Our company has been chosen to supply bouquets to many of the top gown designers in Sydney, Melbourne and New York on the catwalk. This experience ensures that each bouquet is of excellent quality and will not stain or damage the gown. Prices can be negotiated on your needs. Click below to see some of our crystal bouquets on the catwalk! Take that first step and "Dare to be different "
Click here to have a look at a highlight video from the 2015 Ultimate Bridal Event. The "Diplome" and bronze medal was awarded to Jill Dyball for her work in the Bridal Industry by creating crystal bouquets as a bridal accessory. 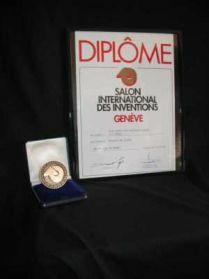 This was awarded in Geneva, Switzerland at the Inventors and Innovators Exhibition, April 2006.